Citroen DS3 Ultra Prestige launched | What Car? 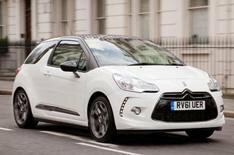 Citroen has added a new Ultra Prestige model to its DS3 range. The Citroen DS3 Ultra Prestige is based on the top-of-the-range DSport model. It comes with a range of sporty and luxurious extras, including a rear spoiler, tinted windows, sat-nav, parking sensors and automatic lights and wipers. Cosmetic additions for the DS3 Ultra Prestige include special roof graphics, leather dashboard trim and two-tone leather seats that grade in colour from white to black. DS3 Ultra Prestige models are available with a choice of two engines: a 1.6 THP 155 petrol unit or the economical 1.6 e-HDi 110 Airdream diesel version. Both come with metallic paint as standard either Polar White or Thorium Grey and 17-inch alloy wheels. The Citroen DS3 Ultra Prestige is available to order now, with prices starting from 20,700 for the 1.6 THP 155. That's 3900 more than the equivalent DSport model.